March 2019: Sushruta Iruvanti, an undergraduate student in the Lammerding Lab, was named the 2019 recipient of the Paul Schreurs Memorial Award. This award from the Cornell CALS Honor Society, is in recognition of excellence in undergraduate research. April 2018: Joseph Long, a first-year BME PhD student in the Lammerding Lab, was awarded an NSF Graduate Research Fellowship. January 2018: Pragya Shah’s collaborative work with the Cantley lab at Weill Cornell Medicine was just published in Nature. November 2017: Congratulations to Greg Fedorchak, a biomedical engineering student in the Lammerding Lab, who successfully defended his PhD thesis. November 2017: Alexandra McGregor, a BME PhD student in the Lammerding lab, and Peter DelNero published an article in Science describing their work bringing together cancer patients and researchers at Cornell to interact and learn from each other. October 2017: The two bake sales by the Lammerding Lab raised over $2400 dollars to benefit the Cancer Resource Center of the Fingers Lakes and the Puerto Rico Hurricane Relief Efforts. October 2017: Alexandra McGregor, a graduate student in the Lammerding lab, received a poster award at the National Cancer Institute Physical Science in Oncology Network (PS-ON) Annual Meeting in Boston. September 2017: Chieh-Ren (Jeremiah) Hsia, a graduate student in the Lammerding lab, was awarded a Government Scholarship to Study Abroad (GSSA) Fellowship from the Ministry of Education of Taiway. September 2017: Ashley Earle, a graduate student in the Lammerding lab, received the BME PhD Teaching Assistant of the Year award. August 2016: Joshua Elacqua, an undergraduate student in the Lammerding lab, received a BMES Student Travel Award to attend the 2016 BMES Annual Meeting in Minneapolis. August 2016: Tyler Kirby, a postdoctoral fellow in the Lammerding lab, was awarded a Fleming Postdoctoral Fellowship from the Weill Institute for Cell and Molecular Biology. May 2016: Ashley Earle (Kaminski), a graduate student in the Lammerding lab, was awarded a US Department of Education GAANN Fellowship. April 2016: Joshua Elacqua, an undergraduate student in the Lammerding Lab, was awarded a Summer 2016 Undergraduate Research Award from the Cornell Engineering Learning Initiatives. March 2016: Our most recent paper was accepted for publication: Denais CM, Gilbert RM, Isermann P, McGregor AL, te Lindert M, Weigelin B, Davidson PM, Friedl P, Wolf K, Lammerding J. Nuclear envelope rupture and repair during cancer cell migration. Science. Published online March 24, 2016. The article was highlighted on the Cornell Chronicle and Science Magazine websites. June 2015: Felicia Sadikin, an undergraduate student in the Lammerding Lab, was selected as one of only 23 Cornell students for the Hunter R. Rawlings III Cornell Presidential Research Scholars Program Class of 2017. May 2015: Jan Lammerding was featured as a faculty spotlight in the Cornell College of Engineering website. May 2015: Greg Fedorchak, a biomedical engineering PhD student in the Lammerding Lab, was selected as one of ten finalists in the CIMIT-APF Primary Care Prize Competition for his Active Distal Limb Heating device. He is now developing his prototype and will compete for the Grand Prize. April 2015: Jan Lammerding was promoted to Associate Professor with indefinite tenure, effective April 1, 2015. March 2015: Rachel Gilbert, a BME MEng student in the Lammerding Lab, received Honorable Mention in the 2015 NSF Graduate Research Fellowship Program. 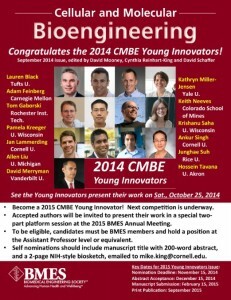 August 2014: Jan Lammerding was featured on the cover of the Cellular and Molecular Bioengineering (CMBE) Journal as one of the inaugural class of CMBE Young Innovators. 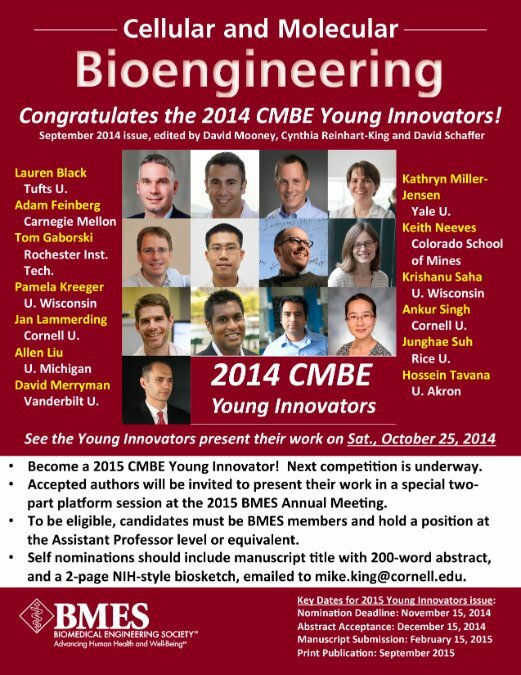 August 2014: Rachel Gilbert, a BME MEng student in the Lammerding lab, was awarded a prestigious BMES Student Travel Grant to attend the 2014 Biomedical Engineering Society (BMES) Annual Meeting in San Antonio. April 2014: Ashley Kaminski was awarded an NSF GK-12 fellowship in Biomedical Engineering to work with teachers and students in K-12 schools to enrich science, technology, engineering and mathematics (STEM) content and instruction for underserved local schools. April 2014: Greg Fedorchak was awarded an NSF Graduate Research Fellowship to study the role of lamin mutations in muscular dystrophy. March 2014: Dennis Chua, an undergraduate student in the Lammerding Lab, was selected as a Merrill Presidential Scholar, an award honoring Cornell University’s most outstanding graduating seniors. See article. January 2014: Maya Bakshi, an undergraduate student in the Lammerding Lab, was selected for the 2014 Teach for America Corps. December 2013: Samantha Olyha, an undergraduate student in the Lammerding Lab, was awarded a prestigious Marshall Scholarship to study at Oxford University. November 2013: Gabriel Lopez, who worked as a summer REU student in the Lammerding Lab, won an Outstanding Presentation Award/Certificate of Achievement in the Engineering, Physics and Mathematics category for his poster “Designing a Microfluidic Device to Study the Deformability of Cancer Cells” at the 2013 Annual Biomedical Research Conference for Minority Students (ABRCMS) in Nashville, TN. October 2013:The Cornell Daily Sun featured an article highlighting the interdisciplinary research in the Lammerding laboratory that addresses the role of cellular biomechanics in a variety of human diseases ranging from muscular dystrophy to premature aging and cancer. See: Cornell Researcher Investigates Nuclear Mutations. August 2013: Greg Fedorchak, a BME PhD student in the Lammerding lab, was awarded a BMES Student Travel Grant to attend the 2013 BMES Annual Meeting in Seattle, Washington. June 2013: Jan Lammerding received an NSF CAREER Award to study the role of nuclear biomechanics during cell migration in 3-D environments. June 2013: Dennis Chua, an undergraduate student in the Lammerding Lab, was awarded a Tau Beta Pi Scholarship for 2013-14. June 2013: Chin Yee Ho was awarded a prestigious postdoctoral fellowship from the American Heart Association. May 2013. Chin Yee Ho’s work on the interplay between lamin A/C, emerin, and myocardin-related transcription factor-A (MRTF-A) was just published in Nature: Ho CY, Jaalouk DE, Vartiainen MK, Lammerding J. Lamin A/C and emerin regulate MKL1-SRF activity by modulating actin dynamics. Nature 2013 May 23;497(7450):507-11. doi: 10.1038/nature12105. April 2013: Greg Fedorchak, was awarded an NSF GK-12 fellowship in Biomedical Engineering to work with teachers and students in K-12 schools to enrich science, technology, engineering and mathematics (STEM) content and instruction for underserved local schools. February 2013: Our article describing the effect of specific disease-causing lamin mutants on nuclear mechanics in vitro and in vivo was accepted for publication: Zwerger M, Jaalouk D, Lombardi M, Isermann P, Mauermann M, Dialynas G, Herrmann H, Wallrath L, Lammerding J. Myopathic lamin mutations impair nuclear stability in cells and tissue and disrupt nucleo-cytoskeletal coupling. Hum. Molecular Genetics. 2013 Jun 15;22(12):2335-49. doi: 10.1093/hmg/ddt079. February 2013: Undergraduate student Shen Ning received a competitive fellowship from the Cornell Oxford Study Abroad Program to spend her junior year at Oxford University, starting in fall 2013. January 2013: Our article describing the importance of lamin A in neutrophil deformability was published: Rowat AC, Jaalouk DE, Zwerger M, Ung WL, Eydelnant IA, Olins D, Olins A, Herrmann H, Weitz DA, Lammerding J. Nuclear envelope composition determines the ability of neutrophil-type cells to passage through micron-scale constrictions. J. Biol Chem. 2013 Jan. 288(12):8610-8. doi: 10.1074/jbc.M112.441535. November 2012: Our article on using microfluidics to study cellular mechanics was published: Isermann P, Davidson PM, Sliz JD, Lammerding J. Assays to measure nuclear mechanics in interphase cells. Current Protoc Cell Biol. 2012;Chapter 22:Unit22.16. doi: 10.1002/0471143030.cb2216s56. June 2012: Just published article: Ho CY, Lammerding J. Lamins at a glance. J. Cell Sci. 2012; 125:2087-2093. May 2012: Shen Ning (freshman) was awarded a prestigious Summer Internship through the Cornell Biology Research Fellowships & Internships (Bio Res) Program. She’ll be working on exploring the molecular mechanisms of muscular laminopathies. May 2012: Congratulations to Kelly Karmann and Josiah Sliz for completing the MEng degrees in the Lammerding Lab.